In 2013, Ben Dyer was appointed to the role of pioneer lay minister with Ormskirk Deanery. His task was to develop ‘something for young adults’ in a predominantly rural area that also included Edge Hill University campus. The original expectation was that Ben would help the 18 existing Anglican churches in the deanery to become better at reaching and keeping young adults. But after a period of prayerful listening, consultation and reflecting on his previous experience of church planting with young adults, the Deanery embraced Ben’s vision of planting a new young adults’ church. At first, the plan was to gather 10-15 young adults in the area who were passionate about starting something new and begin meeting on a Sunday as a small worshipping community. 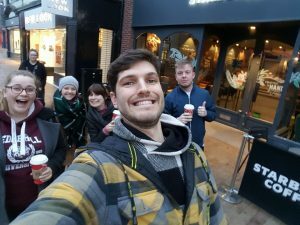 The reality of planting a new church for young adults outside of a city centre was not easy and it was a lot harder to find a core leadership team. Eventually Ben and his wife B, started meeting with two other young adults who were Christians once a week to hang out, eat, pray and study the Bible together. During this time, Ben proposed a thorough five year vision plan of what this new church would look like and together, this small collection of Christians with a heart to start something new, began praying and seeking opportunities to put the vision for Red Church into practice. Ben and the team didn’t want Red Church to be just another Sunday gathering for young adults. They wanted Red Church to be about community and relationships. With a focus on belonging before believing, the structure of Red Church is divided into five different levels designed to engage with different people on different journeys with God. From social events at level 1, to small group discipleship at level 5, there is space for anyone who comes into contact with Red Church to belong and it’s from this belonging that they are able to explore more about Jesus. Ben and the team didn’t want Red Church to be just another Sunday gathering for young adults. They wanted Red Church to be about community and relationships. Within the first year, the mission of Red Church focused on level 1 and level 5, with the small group gatherings growing through invitation, to about 12 people at varying stages of faith and a 5-aside football team with Edge Hill students connecting with student guys who had no contact with church. In response to this growth and the variety of people engaging with Red Church at different stages of faith, they decided to host an Alpha course in a local bar, but this was not as successful as they hoped and Red returned to the two existing levels of small group study and 5-aside football until, nine months later, they launched their Sunday worship service. The Red Church Sunday gathering has now been running for two years, firstly meeting in Ormskirk School and now a Parish Church Hall at 4pm. It is an informal gathering, around tables with lots of space for conversation as well as worship and teaching. Ben identified Sunday afternoon as a great time to gather because it also provides the opportunity for socialising before church for lunch, and afterwards for a pub trip, providing the opportunity to extend the community aspect of church, rather than Sundays being just about a church service. Although it has taken time and the journey towards the vision Ben had five years ago has not been straight forward, Red Church now engages with young adults at all five levels. 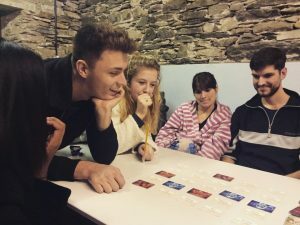 The first level includes the Red church football team, film nights, girls’ or guys’ nights offering a great initial point of contact with young adults and a way of bringing people together and building relationships. 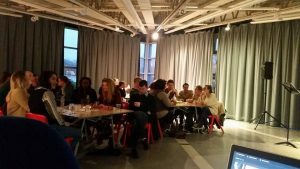 People are then invited to Red Group; an informal discussion group in a cafe, and then Alpha, to explore the Christian faith more in depth. Following this, the weekly Sunday service and small groups provide more opportunities for those who want to continue exploring faith. Despite this clear journey towards becoming a disciple of Jesus, no one is forced to move on to next level if they’re not interested. Ben says that ‘even if they are an atheist, Red church seeks to provide somewhere to belong within what they do – if someone just wants to play football their whole life and not come to Alpha, that’s okay’. The number of people attending Red Church has grown each year; in 2016 there were seven adult baptisms/confirmations/reaffirmations of baptism vows and in 2018, there are now 40 young adults connected to the Red Church community. The congregation is made up entirely of young adults with a large proportion of them from unchurched backgrounds. 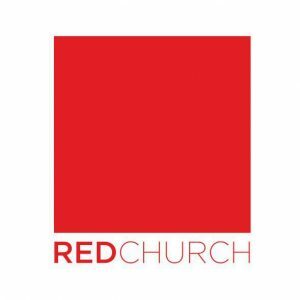 Located in a predominantly rural area, next to a strictly secular University campus, the growth of Red Church is largely attributed to the amount of time invested in personal relationships and the courage to invite people to join the community. 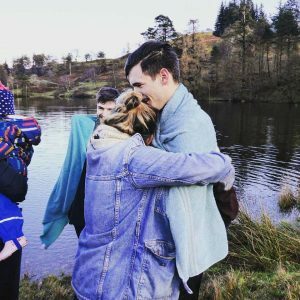 One of the consistent challenges for young adults’ ministry stems from the high turnover of people, making it difficult to invest in and train up new leaders as many of the young adults connecting with Red are only in Ormskirk for 2-3 years. Ben and B have recently begun to hand over the leadership of some of the small groups and for the past two years, Red Church has hosted interns from Germany to support the work and mission of Red Church, but the reality of this common struggle to identify, train and retain leaders also presents a challenge to the sustainability of a congregation like Red. When Ben and B first moved to Ormskirk their prayers were inspired by Ezekial 37. When Ezekial looked out across the desert and saw a valley of dry bones, but then God breathed life into those dry bones and created a vast army. 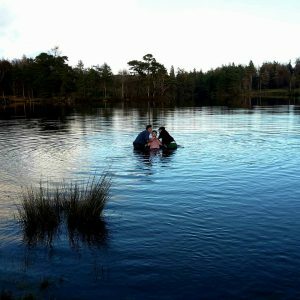 This story inspired Ben and B to see God breathe new life into this missing generation of 20’s and 30’s and to grow a church that helps young adults to follow Jesus, love church and make disciples – right here, in Ormsirk, and that is exactly what they’re doing!